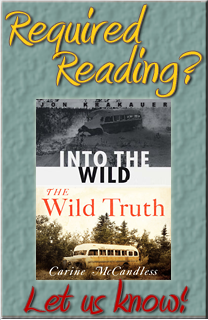 Note: For information about the full-range of teaching materials for The Wild Truth, please contact Carine McCandless or Dr. Douglas Kennedy. Click here for a sampler. Carine’s memoir, The Wild Truth (released in hardcover Nov 2014, paperback Nov 2015), drew immediate interest from educators around the country. In February 2015, Carine spoke at the 34th Annual Conference on the First-Year Experience (FYE) in Dallas, Texas. The primary goal of the conference is to assist educators and administrators in institutions of higher education in the planning, implementing, and refining of programs designed to enhance the transition experience for incoming college freshman. The Wild Truth is a candidate for adoption into upcoming coursework, FYE, and OOP (Outdoor Orientation) programs. Carine consulted closely with Jon Krakauer while he wrote his international bestseller Into the Wild, a harrowing yet inspirational account of the life and death of her brother, Chris McCandless, published in 1996. Later she worked as a script contributor with Sean Penn, who wrote and directed the critically acclaimed film adaptation of the same title, released in 2007. The book has been utilized in education as required reading for high school and college students for almost two decades. For the past several years, Carine has worked with students and their teachers at all grade levels as they delve into its timeless lessons. But she immediately noticed that students were missing much of the information necessary to take their experience with the text from just another assignment up to a level of understanding and value that could remain with them beyond the classroom. After working with Carine, students grasped the importance of self-awareness and of taking on the responsibility to find their own true path rather than simply following one that was laid out for them. Dr. Douglas Kennedy, a Professor and Department Coordinator at Virginia Wesleyan, noticed the extraordinary connection Carine made with students during her first presentation at the college. They began working together to develop programs that combined her valuable personal insight with his more than twenty years of teaching experience. Dr. Kennedy has worked with first-year students his entire career and annually directs a popular first-year seminar titled “Into Your Wild” that utilizes Krakauer’s text to explore ways in which students can embrace what he’s termed “Progressive Independence” to enhance their academic and personal success. Since the release of Carine’s book, The Wild Truth, the partners have been working together to further expand the reach of this curriculum. Also a published author, Dr. Kennedy has given more than one hundred presentations both nationally and internationally. He has led delegations to central Asia to work with teachers, and has taught travel courses with over two hundred participating students. Beyond his teaching experience, he has served as an Associate Dean for Campus Recreation and a Student Activities Coordinator. Dr. Kennedy focuses on high performance management, team building, and leadership by directing his school’s Outdoor Achievement Center — including use of its low and high ropes courses and Alpine Tower. He has chaired his discipline’s national accreditation council and served as an accreditation visitor. In his spare time Dr. Kennedy is a nationally ranked triathlete, a mountaineer who enjoys the outdoors and can often be found there with his wife Betsy and two teenage sons. Known as “Doug” to his students, he has received his college’s highest teaching award — voted upon by students — an unprecedented three times.